You just unlocked the campaign hangar. It's trying to teach you the basics. You'll be able to change ships in a mission or two. Are you sure, because I'm past that mission and completely and on another system and the mission says hull selection is Free, but still looks like that. and it still doesn't account for my lost shop data, I lost all the hulls I had for sale. You should be able to have free hull selection by the time you are tasked with catching the comet. Bring this up with the Dryeres once they get back from their holidays. Seems like perhaps your hullUnlockData may have been corrupted. Have you tried buying any new hulls and seeing if they show up? I've added some better back up save logic for the next patch which will hopefully mitigate save corruptions. I've bought new ships and they show up in my hanger, and I can go back through the story on the missions that unlock ships and they are unlocked. So I'll just replay the important levels. Thank you for the information though. it still isn't giving me the "X3" models of the ships on the mission that should. but I'll unlock them eventually with the lab. So I lost it all again, My hanger is empty and i have no ships to buy even though I have been doing mostly only hull research, I'm not sure what is causing it, but my game does lock up every now and then when I start a mission and I have no choice but to hard reset my PC. Could this be corrupting my ship data. It's also not producing a crash log. but what happens is I start a mission and it takes a long time to load, then I my monitor loses signal and I cannot get it back without a restart. any help? I've lowered my resolution, and it crashes sometimes then too. Should I delete and reinstall would that help, is it possible to keep or even recover any of that data? PS: other than the crashing and Corrupting, I love this game and Congrats on getting Greenlit you guys deserve it. If you are having problems loading missions and lowering settings isn't helping, you might want to try turning Generate Backgrounds off (bottom of video options). What sort of graphics card are you using? Also, what version of the game are you running? The version can be found at the bottom left of the main menu. I thought I had finally fixed the save corruption problem with this last patch (1.0.1.0). I'm sorry this happened to you again, and thank you for bearing with us. I've been trying to figure out how to change hulls from the F3, and I just got to the mission where I need to catch the comet, but I still don't have any hulls to choose from in the campaign mode. I tried replayed Middling Middlemen again, because it's after that mission that you unlock all level 3 hulls, but it didn't help. I tried going to the lab, and it says there are no new hulls to buy there either. I've had some system panics (Nvidia GT610 crash leading to blue screen) while trying to load new missions and it seems like turning off Generate Background has solved that, but if that's caused save file corruption, I need some way to fix it without wiping everything clean. Can I modify the save file manually to fix whatever settings were broken? Hmm, try replaying the mission It Just Got Dramatic in the Litter Glitter Galaxy. This should hopefully unlock all the Rank 3 hulls again. Which version of the game are you currently playing? You can check the version on the bottom left of the main menu screen. I'm really enjoying the game so far. I find the implementation of mouse-controlled archtype abilities could use some tuning. Half the time I move in the direction I intend, and half the time catches a random movement and sends me flying entirely the wrong way. I'm probably going to get a gamepad, since I feel the game is really intended to be played on one. Aside from that one gripe, I think you've done a fantastic job combining strong gameplay mechanics with a compelling story (as much of it as I've gotten through at least). One more question: Should I have access to multiple bays at this stage of the campaign, is that unlocked later, or is that only used for limitting ship selection in multiplayer? Glad you are enjoying it so far! You can try lowering the mouse sensitivity in the Game tab of the options menu if you haven't already. This will make the flick direction of the mouse a bit more accurate and deliberate. Thanks for the tip, that definitely helped improve the response. May the AOEU be with you. 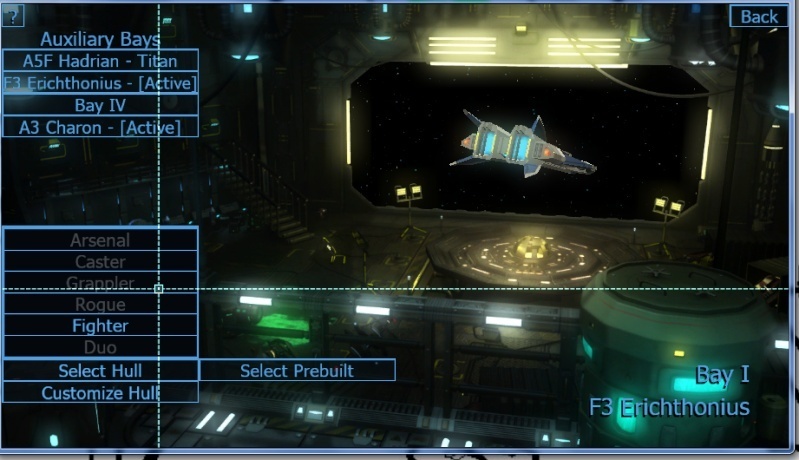 The multiple weapons bays are indeed used for ship selection in Multiplayer, although in two or three separate instances, the contents of those bays will be used as part of the campaign.